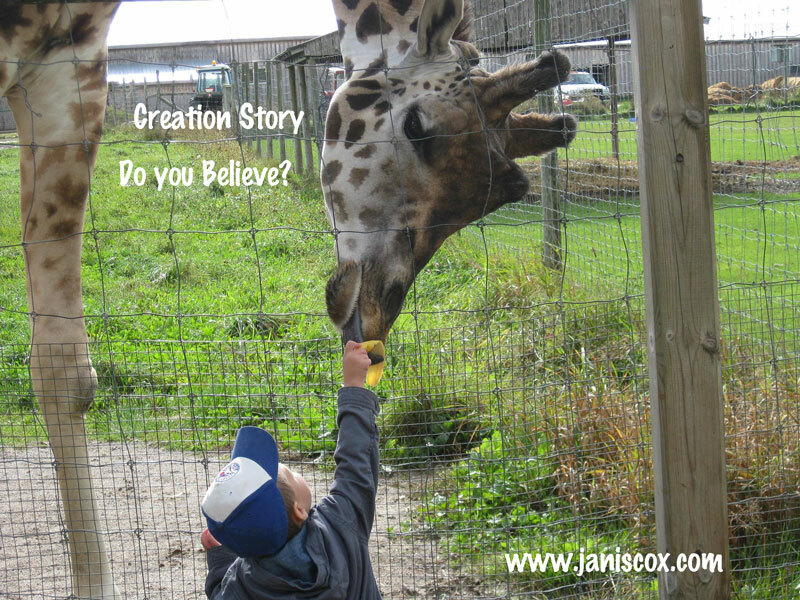 Creation Story – do you believe? Today I look at the creation story. It amazes me how God puts circumstances into my path for me to follow and learn. This is a reworking of a post I had from 2012. When I first heard the word “story” I thought of the story of my week at V.I.B.E. (Vacation Bible School). It was quite a story. We had 23 children; lots of fun; great weather; wonderful leaders and volunteers. We talked about God and His story. We learned we are unique and loved by Him. We learned the Lord’s Prayer. We had fun with each other. Then on Sunday our minister, Harry Morgan, preached about the Creation Story. a giraffe has a spring like thing connecting his head to his body, so he can lift his head quickly. “But the giraffe was engineered with reinforced artery walls, anti-pooling valves, a web of small blood vessels and pressure-sensing nerves that assure an adequate blood flow to the brain at just the right pressure. Creation Ministry. Later in the sermon he talked about honeycomb and bees. Harry talked about the special dance that bees do to explain where to find the best nectar field. 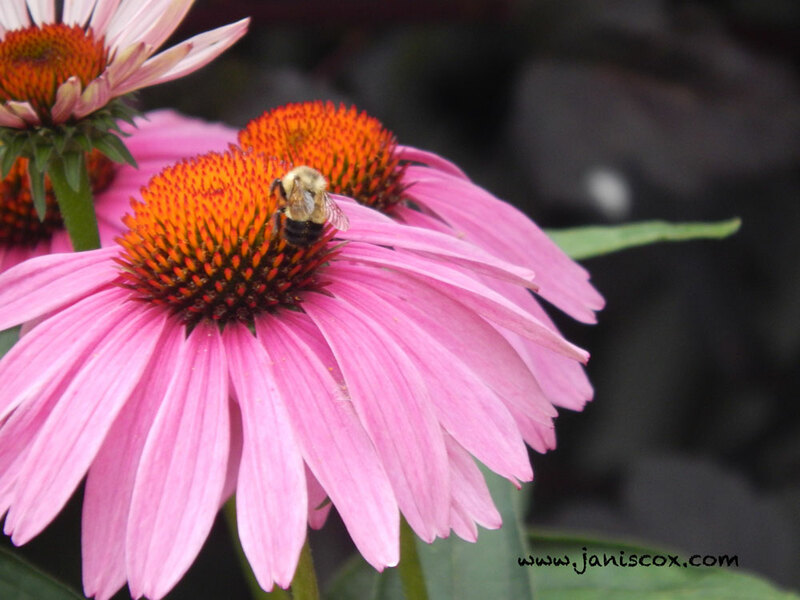 “To identify the location of a food source too distant from the hive to be smelled or seen by the other bees, the scout does a dance on the honeycomb inside the hive” Creation Ministries . Scriptures are consistent on this matter from Old Testament through to the end of the New Testament. “For since the creation of the world God’s invisible qualities—his eternal power and divine nature—have been clearly seen, being understood from what has been made, so that people are without excuse” (Romans 1:20 NIV). I know I can believe the creation story – what the Bible says. There is evidence of a wise Creator – a Designer and we need to answer to Him. May the Holy Spirit continue to show me more and more of God and Jesus. Two Stories on the same day- both about life and God. This entry was posted in Sermons and tagged Creation, God, Jesus, life, New Testament, Old Testament, VIBE on February 9, 2016 by JanisCox. Noreen showed us people – all sorts of people from all parts of the world; all sorts of people – poor, rich, able-bodied, physically challenged; everyone and everybody. Then she discussed God’s two commandments – to love God, and to love others. She said is was simple – just do it. But then she asked – how can we love everyone? She said it is not difficult to love if we choose to do so. But in order to love others we also have to love ourselves. Jesus said, “love your neighbour as yourself”. Ask God to help you love a person who is unlovable. God loves us just the way we are. This certainly is the same theme as my new children’s book, Tadeo Turtle. Here is the opening song at the Paralympics in London – “I Am What I Am”. This entry was posted in Sermons and tagged commandments, God, Haliburton United Church, mats for haiti, Nikki Rosen, Noreen Ueberer, sermon on September 10, 2012 by JanisCox. Have you Made a Place for God in Your Life? Our ministerial for Haliburton held its 5th Sizzling Summer Service in the park – but this year we held it inside a church. Yes we had rain. And we were very grateful for the rain. No one complained when we met together – crowded, happy and joyful. Our churches joined together to praise and worship God. With a wonderful band, our good singing and lots of worshippers we made a “joyful noise onto the Lord”. Doug Ross from the Gospel Lighthouse gave the sermon. He is a new pastor to Haliburton and started by praising the ministerial for being “of one accord” and acting like the Acts 2 church. He said it was nice to see leaders putting aside “doctrinal statements and being hungry for God!”. He based his sermon on a story from 2 Kings 4:8-37 – The story of Elisha meeting the Shunammite woman. This woman was hungry for God. She even built a special room for Elisha so he would always stay with her when he visited the area. Elisha blessed her thoughtfulness with a son. But the son later died. The woman went to Elisha and told him he had to make the trip back to her house to save her son. “You must come with me,” she said. Elisha lay on the boy and he revived. She had built a “place for God” in her home. Doug challenged us – Do we have a place for God? Do we look after it? Are you able to say: “It is well with my soul”? As I spoke about in How Else Can Satan Distract Us?, we are an easily distracted people. I challenge you to make sure you make a place for God in your heart; that you look after that spot; care for it; nurture it; – so you can say those words with great meaning – IT IS WELL WITH MY SOUL. This entry was posted in Prayer, Sermons and tagged Doug Ross, God, joint service, sermon, worship on August 6, 2012 by JanisCox. How Can we Use 86 004 seconds wisely? So many things connected with me today in the sermon that I had to tell you about it. We had a guest lay preacher, Glenda Burk, speak to us on Busy Versus Fruitful. I know I have been “busy” the past few weeks with VIBE (VBS) and getting ready for my trip to Poland. However, I have never felt stressed. I always took time to talk to God, see family, and go boating with my hubby and have our famous cribbage matches (which I have been losing most lately). Today Glenda talked about “busyness” and how it might negatively affect our lives. But she also talked about being fruitful – that God expects us to draw on our talents to further His Kingdom on earth. God gave us the gift of TIME. He gave the same amount to everyone. He encourages us to use it wisely. There are 86 400 seconds in every day. How are we using them? If you say you “have no time” – then it is time to look at your priorities and make choices that honour God. So eliminate something. Every moment we waste we won’t get back. – that is useless thinking. It has been shown that worry makes us sick and even grouchy. Guilt is totally useless. Jesus has delivered us. So believe Him and drop the guilt. Put anger aside. We only hurt ourselves more when we are angry. Bitterness prevents healing. Glenda gave us good advice. “Just get over it. And forgive”. Dead works produce no fruit. We only get frustrated and worn out if we try to do things when God is not in them. Instead, let God in – begin to pray – God will open doors. God said, “apart from me you can do nothing”. it is he who will save us” (Isaiah 33:22 NIV). time with others – serve them. Jesus never sat on the sidelines. Put an effort into relationships. Don’t put off for another time something we may not ever get time to do again. Please read What are Your Tin Gods? This entry was posted in Prayer, Sermons and tagged fruitful, Glenda Burk, honour God, Jan Cox, time, trust, vine and branches on July 16, 2012 by JanisCox.